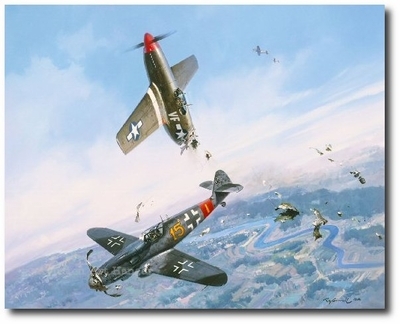 Lt. Joe Bennett from the 4th FG in his P-51B was attacked by Lt. Hubert Heckman in his Me-109. Heckman's guns jammed but he did not want the P-51 to get away, so he rammed Bennett! Bennett bailed out and Heckman crash landed. Bennett became a POW. After the war, the two became friends and met every year for their reunion. They are now both deceased.